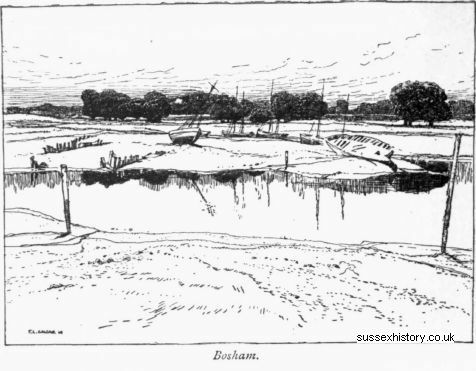 Bosham and history—An expensive pun—The Bosham bells—Chidham wheat—The Manhood peninsula—Selsey's adders—Selsey Bill—St. Wilfrid and the Sussex heathen—Pagham Harbour in its palmy days— Bognor—Felpham's great rider—Mr. Hayley and Mrs. Opie—An epitaph and a poem—A fairy's funeral—William Blake in Sussex—The trial of a traitor. On leaving Chichester West Street becomes the Portsmouth Road and passes through Fishbourne, a pleasant but dusty village. A mile or so beyond, and a little to the south, is Bosham, on one of the several arms of Chichester Harbour, once of some importance but now chiefly mud. Bosham is the most interest­ing village in what may be called the Selsey peninsula. Yet how has its glory diminished ! What is now a quiet abode of fishermen and the tarrying-place of yachtsmen and artists (there are few Royal Academy exhibitions without the spire of Bosham church) has been in its time a very factory of history.